This topic presents the main tasks to deploy the Text Analytics module. Ensure that you use a Coveo Enterprise Search version 7.0.4863+ that is fully compatible with the Text Analytics module version 2.0.5+. Ensure that your Coveo Master server uses the Coveo license with text analytics support. CES 7.0.4887+ (November 2012) In the Administration Tool, go to the Configuration > License page, and verify that a check mark appears next to Text Analytics Allowed (see What Information Is Displayed in the License Page?). Note: When the Coveo license does not support text analytics and you attempt to run a text analytics run or job, the Text Analytics is not allowed by CES license message appears in the TAnGO Job Logs panel. Select or create an Active Directory domain user that you will set later to run the Coveo Job Scheduling (CJS) service that manages text analytics runs and jobs. Password that never changes to prevent access errors. Note: If you must use an account with a password that must change regularly, you will need to also change the password for Coveo Job Scheduling Service 2 (Text Analytics) in Windows Services whenever it changes in Active Directory. Tip: Use the same account as the one running the CES service (see About the CES Service Logon Account). Grant super user access (with the Access Everything option selected) to the account to ensure that the text analytics processes have read access to all indexed documents (see Granting super user access). Note the super user ID. You will need it later. Install the Text Analytics module (see Installing the Text Analytics Module). Set the basic parameters needed by all the text analytics runs and jobs (see Performing the First Time Setup of the Text Analytics Module). Use an out-of-the-box run template to produce your first text analytics tag fields in the unified index (see Testing the Text Analytics Installation). 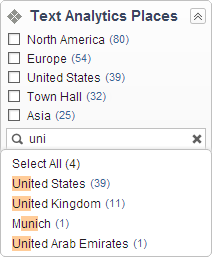 Example: Create a facet that lists the places found in your documents using the @txtanplace tag field. The facet allows end-users to easily find documents referring to selected locations.